Since December I’ve been working on a pile of illustrations based on the folklore of Guernsey. Here’s a cheery little tale called Lé Gibet des Faies. All the paintings are in the style of my Mythic Village pictures – pen and ink and watercolour (with assistance from Prismacolor pencils when things get out of control). Unusually, I didn’t make a colour rough before commencing any of the pictures, just the usual tonal pencil/Photoshop preparations. That’s not to say I didn’t think very hard about the colours I wanted to use – so much so I had quite a strong mental polaroid* of what I was aiming for before I started flinging paint about. Several of the other pictures involve various nocturnal shenanigans so it was important they didn’t look too similar colour-wise. Along with eight paintings, I’ve made thirteen pencil drawings. 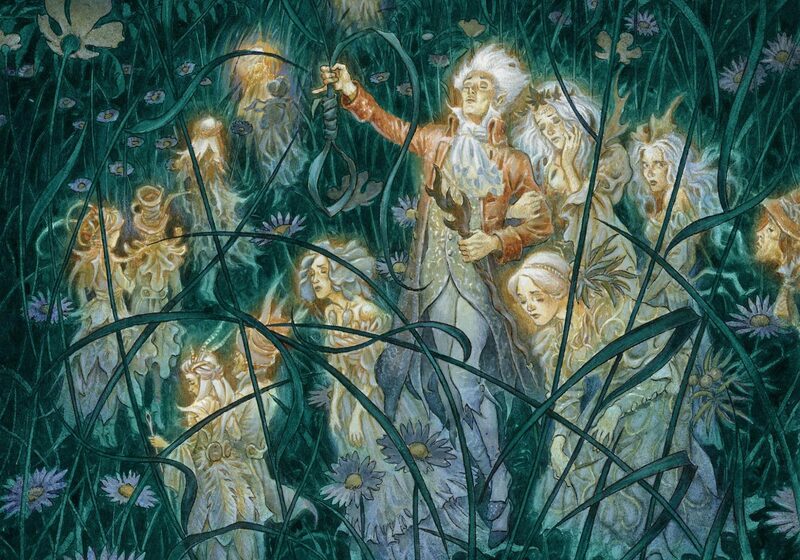 I had already conceived the central characters to this tale (there’s a little bit of a homage to Susanna Clarke in the depiction of the ‘Gentleman’ with his thistledown hair). The client wasn’t happy with the original elaborate hairstyle of his companion, but it wasn’t too difficult to re-style her. I love working in pencil – it really is the least stressful of mediums (assuming your eraser hasn’t been eaten by a dog). *Mental Polaroid – good name for a band?